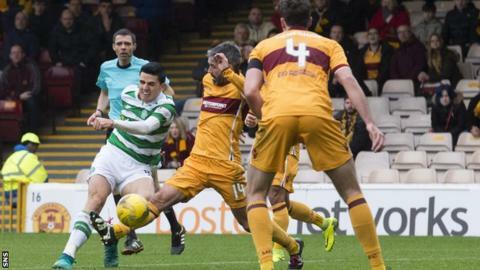 Tom Rogic's last-minute goal gave Celtic victory over Motherwell in a thrilling Premiership match. Louis Moult scored twice - a first-time lob and a close-range volley - to put the hosts in charge. However, Callum McGregor's strike brought Celtic back into contention and Patrick Roberts headed them level. Lionel Ainsworth quickly volleyed Well ahead again but that lead did not last long as Stuart Armstrong fired home before Rogic's low drive settled it. Celtic ended the day still eight points clear at the top of the division and still have three games in hand. This was a stunning game, a thrill-fest from start to finish with goals, chances, drama and aggravation all played out in a thunderous Fir Park. The champions had not conceded in the league for 10 hours and were up against a Motherwell team that had conceded three in 90 minutes against Hearts last time out. This looked like it was going to be another Celtic stroll, but Moult dynamited that notion after just three minutes. It was a sumptuous finish, a thing of beauty. Stephen McManus aimed his downfield pass at the space occupied by Moult and his marker, Kolo Toure. The striker stole away from Toure and cushioned the dropping ball first time over Craig Gordon's head. Toure's defending was poor and Gordon was caught too far off his line but Moult's precision was a delight. 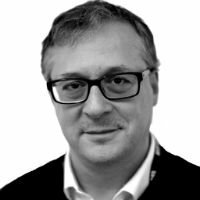 Motherwell paid little regard for Celtic's reputation, hustling and harrying them, bringing a real edge to their game that Celtic found hard to deal with for a long time. Moult was inches away from making it 2-0 just before the half-hour, but he got the job done just after. Mikael Lustig was robbed of possession by Ross MacLean - the Swede was livid at the tackle - and when MacLean crossed to the back post, Moult took advantage of more slack Toure defending to bang in his second of the game and his 10th of the season. Brendan Rodgers changed his formation at the break and went three at the back to give Celtic's midfield more ballast. It worked. Within three minutes, McGregor, a first-half substitute for Emilio Izaguirre, played a one-two with the excellent Armstong and McGregor stroked his shot past Craig Samson. Celtic now had Motherwell under the cosh and Armstrong's delivery from the left saw Roberts head the visitors level at the back post. You'd have gambled your last penny on Celtic motoring on to win it at that point. Motherwell's energy levels were running out and they were seeing precious little of the ball. They looked like they were barely hanging on. Just when you thought that Motherwell's day was going to peter out into defeat, they roused themselves again and got themselves back in front. Roberts had scored in the 69th minute, then from a Steven Hammell cross, Ainsworth scored in the 70th. Celtic's defence was left with giant gaps and the substitute pocked home from close range. Sixty seconds later, we had the third goal in as many minutes when Armstrong's shot on the turn beat Samson. Fast, furious, frenetic and utterly absorbing. A minute from time, Rogic moved forward, picked his spot and smashed a shot past Samson to win this most gob-smacking game. Celtic's character and quality in adversity was huge. Motherwell gave so much and did so many superb things, but, sickeningly for Mark McGhee and his team, they were denied the consolation of a point. Motherwell manager Mark McGhee: "We know we're a team that concede goals. We have to fix that, somehow we have to fix that. "Our first-half performance was fantastic, the quality of our three goals was fantastic. "We've played a really good Celtic team, they've fought back into it and eventually they've got a winning goal. We've just got to live with that but our performance was good." Celtic manager Brendan Rodgers: "We were poor in the first half. We got off to an awful start. "We changed the system at half-time to 3-4-3. We were absolutely brilliant second half. To score the four goals, to win the game, it really shows the mentality of the team. "Across the team, I have to give them huge credit because we had to put risk in the game. They took on the risk and they got the reward. I'm delighted for them. "That was a great, great victory for us and give credit to Motherwell as well because I thought that they were set up very, very well." Match ends, Motherwell 3, Celtic 4. Second Half ends, Motherwell 3, Celtic 4. Substitution, Motherwell. Ryan Bowman replaces Richard Tait. Attempt missed. James Forrest (Celtic) right footed shot from the left side of the box is close, but misses to the right. Tomas Rogic (Celtic) is shown the yellow card for excessive celebration. Goal! Motherwell 3, Celtic 4. Tomas Rogic (Celtic) right footed shot from outside the box to the bottom right corner. Attempt saved. Stephen McManus (Motherwell) header from the centre of the box is saved in the centre of the goal. Corner, Motherwell. Conceded by Scott Brown. Foul by Kolo Touré (Celtic). Attempt blocked. Tomas Rogic (Celtic) right footed shot from the right side of the box is blocked. Attempt saved. Moussa Dembele (Celtic) right footed shot from very close range is saved in the bottom right corner. Attempt saved. Stuart Armstrong (Celtic) right footed shot from outside the box is saved in the bottom right corner. Corner, Celtic. Conceded by Steven Hammell. Lionel Ainsworth (Motherwell) is shown the yellow card. Substitution, Motherwell. Jack McMillan replaces Ross MacLean. Goal! Motherwell 3, Celtic 3. Stuart Armstrong (Celtic) right footed shot from the centre of the box to the bottom left corner. Assisted by Patrick Roberts. Goal! Motherwell 3, Celtic 2. Lionel Ainsworth (Motherwell) right footed shot from the right side of the six yard box to the bottom left corner. Assisted by Steven Hammell. Goal! Motherwell 2, Celtic 2. Patrick Roberts (Celtic) header from the right side of the six yard box to the bottom right corner. Assisted by Stuart Armstrong. Substitution, Motherwell. Lionel Ainsworth replaces Chris Cadden because of an injury. Attempt saved. Moussa Dembele (Celtic) right footed shot from outside the box is saved in the centre of the goal. Attempt blocked. Tomas Rogic (Celtic) right footed shot from outside the box is blocked. Attempt saved. Tomas Rogic (Celtic) right footed shot from outside the box is saved in the bottom right corner. Stephen McManus (Motherwell) is shown the yellow card for a bad foul. Attempt saved. Stuart Armstrong (Celtic) right footed shot from outside the box is saved in the centre of the goal. Attempt saved. Scott McDonald (Motherwell) right footed shot from outside the box is saved in the centre of the goal. Attempt missed. James Forrest (Celtic) right footed shot from the centre of the box is too high. Corner, Motherwell. Conceded by Kolo Touré.